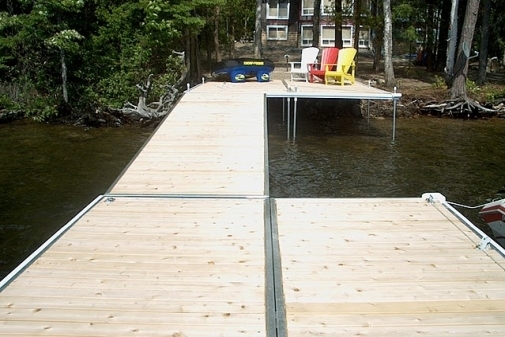 Our Designer Series Floating Docks are hand crafted by experienced welders using the highest quality Canadian materials at our factory in Muskoka. Each section utilizes marine-grade aluminum framing and stainless steel fasteners to ensure a completely rust free design. Decking choices include Western Red Cedar, Solid PVC or Aluminum. A Designer Series Floating Dock from On the Water Designs makes a very durable and elegant centerpiece to any waterfront. Every Designer Series Floating Dock utilizes very reliable foam filled plastic PermaFloat dock floats. Our full range of float sizes allow us to choose the right float to fit your design. Most residential applications are designed for 25 lbs / SqFt, while docks typically holding more people are upgraded to 40 lbs / SqFt. 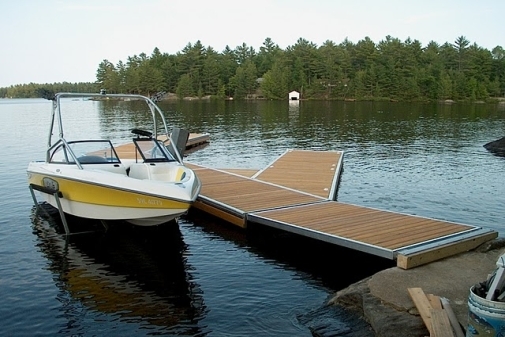 Our standard designs float at 14″ off the water, but we also have designs that can float at 18″ to make it easier to step from your dock to a pontoon boat. 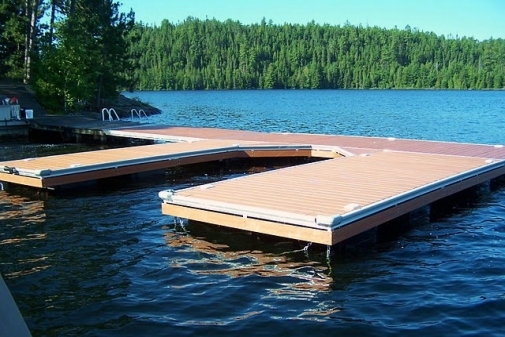 Designer Series Floating Docks come in a variety of standard sizes including 4′, 6′, 8′ & 10′ Wide and 10′, 15′ & 20′ Long. Custom sizes and designs allow for additional flexibility where needed. All frames include decking support stringers every 16″ allowing for almost any choice of decking both now and in the future. Our exclusive deck panel clips clamp decking securely to the frame. Your dock is exposed to the harshest conditions mother nature has to offer. Hot, Cold, Storm Winds and High Waves. All before your family arrives for a weekend of swimming, skiing and relaxing on the water. You want a dock that is ready when you are. Every company claims to build the best, most durable dock available but the truth is easy to uncover. At On the Water Designs, we warranty our dock frames for a full 10 Years.Our warranty is NOT Prorated meaning you aren’t responsible for 10% of the cost in year 1, 20% in year 2 etc. like some of our competitors. With On the Water Designs, you have the same great coverage at year 10 as you did the day you bought the dock. We are able to offer the best warranty in the business because most of our clients never need to use it. To us, that is the mark of a great quality dock system. Not sure what type of dock you need?